Real estate appreciation has returned to the Tallahassee real estate market, but our largest homes are not sharing in celebration. 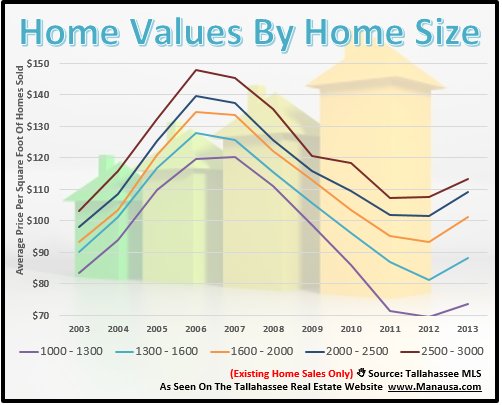 Earlier in the week, we showed that the supply and demand for homes in Tallahassee was moving back towards balance, and today's report shows how home values have changed over the past year. People throw around the term "appreciation" (or "depreciation") awfully loosely in real estate. I've seen many real estate professionals speak of value change based upon changes in average home prices, a practice that is riddled with erroneous conclusions. A better way to track the market to see if homes are worth more or less over time is to track the average price per square foot of homes sold over time. Though not an effective way to determine the value of a singular property, it is a very acceptable barometer for tracking value changes in the housing market. The graph above shows that homes that are between 1000 square feet and 3000 square feet appreciated last year. But how about the larger homes for sale in Tallahassee, how are they doing? Apparently, homes below 4000 square feet are all enjoying a recovery in the Tallahassee real estate market, but the largest homes (those over 4000 square feet) are still giving way to the glut that remains from the over-building that occurred during the boom of the housing market from 2002 through 2006. The following table shows the level of real estate appreciation by home size range in 2013 and cumulatively since 2003. Interestingly, two classes of homes are still receding. Investment grade properties and luxury homes, both of which exploded in construction during the peak of the housing market, are worth less today than they were in 2003. But when it comes to the bread and butter of our market, where most homeowners live, we can see that home values are returning. The table above allows us to state that on average, 2013 has posted a 6.2% appreciation rate and that homes are worth 1.8% more today than they were in 2003. But we can also see that those numbers cannot be applied evenly across all homes sizes and price ranges. 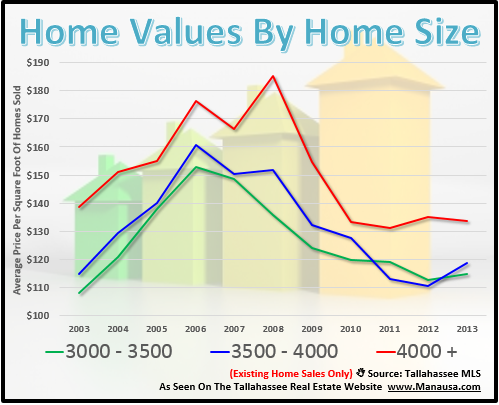 So if you really want to know what your home is worth, just drop me a note and we'll show you how your home has fared through the bubble and the recovery of the Tallahassee real estate market.